Grapes and Gusto™ | Gilat Ben-Dor · The wheat from the chaff: Can you tell organic bread by taste? The wheat from the chaff: Can you tell organic bread by taste? 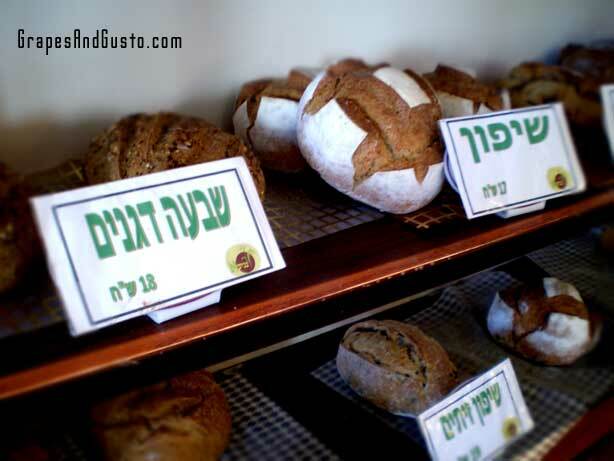 Boutique L’chamim ("Bread Boutique") in northern Tel Aviv offers a tempting array of goody-encrusted breads. Organic bread. How warm and fuzzy. Just those words, organic bread, invoke images of crusty, chewy loaves that could scratch your face but are so delicious, especially when hot from the oven. These dreamy loaves would also be infused with highly unusual ingredients, lovingly prepared by a gentle artisan who likely favors handmade sweaters and vintage note cards. “Hi there!” they would cheerfully greet me as I walk into their fragrant bakery, feeling the need to hide my BlackBerry and other worldly trappings. “Care for some lavender oat spelt bread? And a bedtime story?” Perhaps my imagination has taken over (yet again), but I do enjoy the idea of a natural, accidental sort of delicacy – the cool gourmet that wasn’t even trying – through its sheer simplicity of preparation. And rightfully so. Who wouldn’t want their bread free of chemicals, pesticides, or other extra processing elements that diminish its otherwise grainy goodness? But…here’s the million-dollar question: Could you tell whether you were eating organic versus “regular” bread if there was no fancy sign about it? We could put this to the test by having bakers participate in a blind tasting. Would they be stumped? If not, what would be the distinguishing feature that would whisper organic to their palates? I am still on my Israel kick from a recent trip there. If you happen to visit or live in Tel Aviv and are seeking organic breads, Boutique L’chamim (Bread Boutique) is your answer. It is a pleasant walk away from the milestone Even G’virol Street. The Boutique sells a variety of breads and sweet baked goods, as well as a collection of jams, spreads and tapenades. Organic or not, I am partial to breads with suspended “stuff” in them (walnuts, olives, sun-dried tomatoes…). Now think back. What is the most unique bread you’ve ever tasted? And, if blindfolded, could you distinguish between organic and non-organic bread? Ok I just LOVE the “suspended stuff” in bread!! It makes everything better! LOL Like it!